Project Description: In this investigation, the deformation response of group pile foundations is evaluated in swelling rock medium specially in claystone layers. Field test results are used to develop a computer model for the group pile system. The group pile foundation behavior is evaluated based on different surcharge loads and claystone swelling circumstances. Many foundations fail because of experiencing excessive movements. It has been observed that the foundations built on expansive soils/rocks are subject to uplifts when unsaturated medium is exposed to moisture increase. Misdiagnosis of the swell potential will result in damage and consequently repair and maintenance costs. Therefore, proper characterization of the soil/rock properties is one of the initial and important stages in selecting the best foundation system and design procedure. Expansive ground is characterized by considering moisture contents, swell potential, Atterberg limits, and suction capacity of the expansive medium (Selig et al. 1978; McKeen et al. 1992; Fityus et al. 2004). The analysis of uplift movements in expansive soil/rock is a very complex hydro-mechanical issue. The suction, degree of saturation, and hydraulic properties of the material are main influencing factors in swelling response (McKeen 2001). The mechanics of soil-water retention determines the meniscus arrangement between particles. The variation in soil’s volume with high matric suction is expected to be non-linear with the rate of changes in saturation ratio and is dependent on the amount of water absorbed by the material (Picornell and Lytton 1984; Nowamooz et al. 2008; Lu and Khorshidi 2015). There are studies that focused on estimating the volumetric response of swelling soil/rock using Atterberg limits, density, moisture content, swell characteristics and suction capacity of the expansive clay or mud rock materials (Picornell and Lytton 1984; Huan et al. 1986; Sarman et al. 1994; Doostmohammadi et al. 2009; Osouli et al. 2014; Zamiran and Osouli 2015a; Zamiran et al. 2015). These studies primarily consider swelling material and not its interaction with foundations. Numerous scholars have studied the behaviorof shallow foundation systems founded in expansive soil/rock (Payne 1991; El-Garhy et al. 2000; Nowamooz et al. 2008) and developed constitutive models to relate the swelling stresses and strains. However, these models either are very specific to shallow foundation applications or need many complicated input parameters from laboratory test results. In terms of deep foundations, there are many studies that investigate on single or group behavior of foundations as well as rock/soil interaction with pile/pier in non-swelling rocks (Poulos and Davis 1968; Chen 1989; Huichang 1991; Mylonakis and Gazetas 1998; Lee et al. 2002; Lee 2012; Tschuchnigg and Schweiger 2015; Tradigo et al. 2016). These studies suggest: 1) the behavior of group deep foundation is a three dimensional; 2) the number and spacing of piles will affect the pile group behavior; 3) the soil/rock layering has a detrimental effect on vertical movement of piles. However, there are limited resources available in the literatures which focus on the interaction of deep foundations and swelling weathered soil or rock. In terms of single pier/pile, the governing parameters in determining their behavior in swelling soils/rocks are pier/pile length and diameter, acting loads, shear modulus of surrounding swelling soil near shaft, modulus of elasticity of the pile, and the wetting front development (Fan et al. 2007). In these foundations, the upward movement of the pile is reduced when the pile length is increased or the pile diameter is decreased. In terms of group pier/pile behavior in swelling rocks, there is the least amount of information available in the literature. In this study, the performance of pier group foundation of manufacturing equipment founded in swelling claystone rock is investigated. The weathered claystone interaction with the foundation was analyzed using survey data, extensometer readings, laboratory swell test results, moisture content data of in-place material, and Atterberg limits of the rock. Using finite difference method and swell laboratory test results, a novel numerically-based methodology is presented to analyze the performance of a group pier foundation founded in swelling medium. The case study is a manufacturing building. The location and sensitive information could not be revealed due to confidentiality agreement reasons. The building is supported on a group pier foundation founded in claystone. The post-construction swell in the foundation soil/rock resulted in uplift forces on the equipment and building foundation. The differential displacement tolerance of 0.25 cm for the manufacturing equipment foundation was greatly exceeded over a 9 year period. 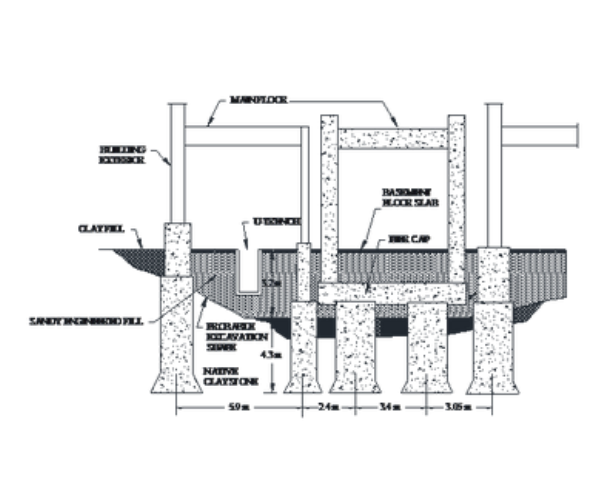 The manufacturing equipment is supported on vertical columns which rest on a 1.1 to 1.4 m thick pier cap incorporating 102 drilled-in piers (See Fig. 1). The pier cap was cast in place on what is essentially residuum. This continuous cap is 164 m long, 7 m wide, and is at Elevation 364.8 m with 0.15 m overlap socket into the piers. The pier shafts are 1.2 to 1.8 m in diameter (typically 1.5 to 1.8 m) and generally belled at the bottom. The bells are up to 2.7 m in diameter (typically 1.8 to 2.4 m). Pier bottoms were found at Elevation 359.7 m. The pier center-to-center spacing (CC) is approximately 3.7 m in both the east-west and north-south direction, leaving about 1.5 m of soil between each bell and 2.1 m of soil between each pier in both directions. In other words, the center-to-center spacing between piers is about 1.75 to 2.7 and 1.85 to 2.8 times the diameter in the east-west and north-south directions, respectively. A typical plan and section view of the foundation system can also be seen in Fig. 1. All the piers beneath the pier cap were about 4.1 m long, and the top of each pier (or bottom of the pier cap) is 2.6 m below the basement floor. In addition to the piers installed to support the manufacturing assembly, there are piers close and adjacent to the north and south sides of the pier cap which support building loads. The bottom of these building and equipment piers are about 6.7 m below the basement floor. Because of the manufacturing process, the foundation is exposed to wet conditions on the east side and dry conditions on the west side. To handle the processed water, a “U” trench was installed in the basement floor around the perimeter of the pier cap to carry water outside of the building. The cross section of the subsurface is shown in Fig. 2. It is worth mentioning that 3 m to 6.1 m of the residuum to weathered claystone had to be cut to install the pier cap. The cut material was replaced with inert fill to eliminate the potential for foundation soil/rock swelling. A sandy engineered fill was placed between the basement floor and the pier cap to mitigate the swell potential of the foundation subsurface. To further mitigate the effects of the Water-Based Effluent draining into the subsurface claystone, an Underground Drainage System was installed during construction to drain from west to east along both the north and south sides of the pier cap. Despite these measures, the excess water drained into the engineered fill and soaked the weathered claystone. As indicated earlier, there are very limited available analyses methods or constitutive material models that account for interaction between swelling soil/rock and group deep foundations. In this study, a novel and practical methodology is developed to integrate the swell lab test results with numerical models to assess the upward movement of group pier foundations. These analyses were also used to better understand the effect of center-to-center spacing of piers and superstructure pressure on upward movement of group piers in swelling rocks. To avoid high computational costs, a foundation system including ten piers was considered to represent only a portion of the foundation in the wet side of this case study. It is worth noting that the typical pier dimensions and material properties of the studied site were utilized in the simulations. These models focused on modeling very wet conditions, where the matric suction is low and it is aimed for representing the sites that are in similar conditions. The group pier system founded in swelling medium is three dimensionally simulated using FLAC3D Version 5.01 (2013). FLAC is advanced geotechnical numerical software based on finite difference formulation that can model complex behaviors, such as large displacement and strains, non-linear material behavior or unstable systems.